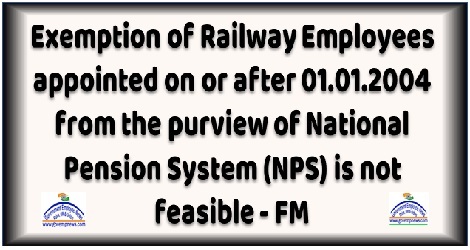 Sub : Exemption of Railway employees appointed on or after 01.01.2004 from the purview of National Pension System (NPS) – regarding. The undersigned is directed to refer to NFIRs letter No. IV/NPS/PFRDA BILL/Part- I dated 13.02.2017, 26.10.2017 and 11.12.2017 on the above subject. 2. In this regard it is informed that on the request of NFIR, Hon’ble former Minister of Railways, Sh.Suresh Prabhu had written a D.O letter dated 11.04.2017 to the Hon’ble Minister of Finance and Corporate Affairs, Sh.Arun Jaitley, to have a second look on the issue of exemption of Railway employees from the application of National Pension System (NPS). In reply, Hon’ble Minister of Finance and Corporate Affairs Sh. 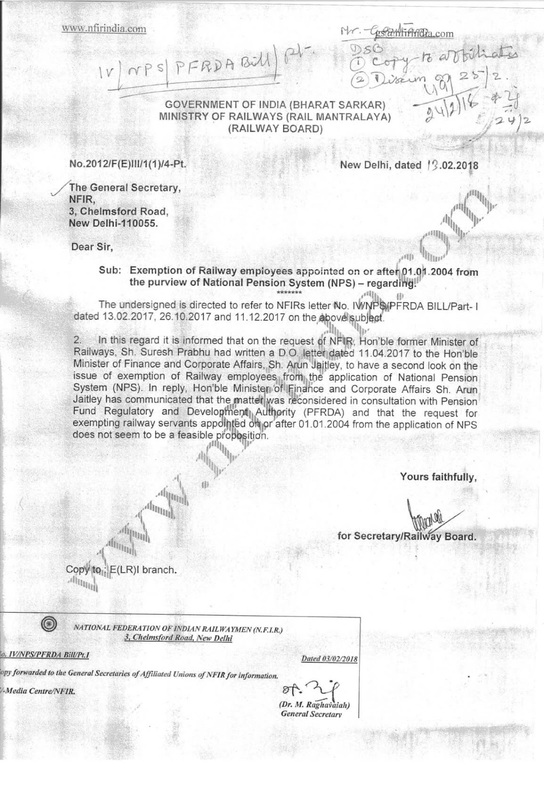 Arun Jaitley has communicated that the matter was reconsidered in consultation with pension Fund Regulatory and Development Authority (PFRDA) and that the request for exemption railway servants appointed on or after 01.01.2004 from the application of NPS does not seem to be feasible proposition.